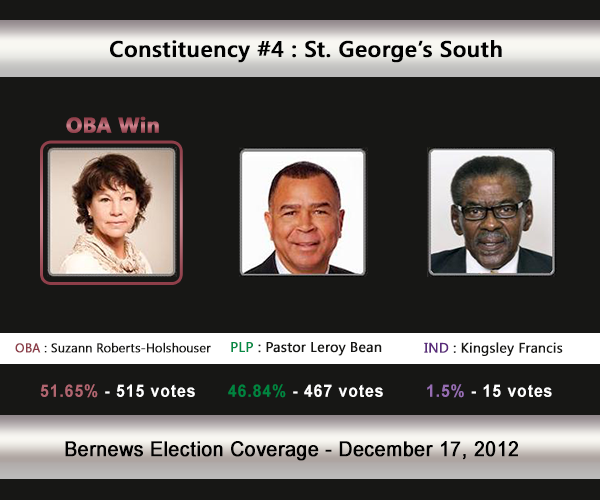 [UPDATE Dec 17: Election Results] Suzann Roberts-Holshouser [OBA] has defeated Pastor Leroy Bean [PLP] and Kingsley Francis [IND] in C#4 St. George’s South. The incumbent was Donte Hunt [OBA] who moved constituencies. The incumbent Donte Hunt [OBA] is moving to challenge Wayne Furbert in Constituency #6 Hamilton West, paving the way for Suzann Roberts-Holshouser to stand for the OBA while Pastor Leroy Bean will stand for the PLP. The polling station is Trinity Church Hall, 19 Trinity Church Road, Hamilton Parish. In the 2007 General Election Donte Hunt [under the UBP] won 51.18% of the vote vs the PLP’s Phil Perinchief [544-519]. In the 2003 General Election, Renee Webb [PLP] won with 50.45% of the vote against Tim Smith [UBP] who received 49.55%. The areas St. George’s South consists of, or is located by, includes: Paynters Road, Summit View Drive, Abbot’s Cliff Road, St. David’s Road, Lower Gates Road, Southside Road, Chapel of Ease Road and more. Pastor Leroy Bean is the founder of Challenging and Reclaiming the True Essence of Life – C.A.R.T.E.L.- an organization which promotes an anti-gang, anti-violence philosophy. It is designed to raise awareness of anti-social behaviour and gang mentality as well as identify and provide solutions for a more productive lifestyle. He is also the founder of Transfiguration Ministries Church and Transfiguration Ministries Safe House, a privately run programme for male substance abusers. He was educated locally at Francis Patton Primary School and Whitney Institute. Overseas, Pastor Bean attended Fryeburg Academy in Maine, and Warner Southern College in Florida. He holds a Bachelor’s degree in Christian Counselling (Addiction) from Freedom Bible College & Seminary. He also obtained his Master’s Degree in Christian Counselling (Family) from Freedom Bible College & Seminary. In July 2007, Pastor Bean received a Master’s Degree in Government Law and Public Policy from Regent University in Virginia Beach, Virginia. Pastor Bean has extensive experience in counselling and residential treatment programmes and was involved in the first gang negotiations sponsored by the Bermuda Police Department in 2003. He has worked as a Residential Care Officer, a Nouthetic Counsellor, and as an Addiction Counsellor for various organizations in Bermuda. Currently, through Transfiguration Ministries, he oversees the Transfiguration Safe House for substance abusers, and acts as a liaison between facilities overseas.Pastor Bean has served on numerous boards and committees. Currently he serves as the Chairman of the Trucks Advisory Board at the Transport Control Department, and as a member of the Spiritual Mentoring Board at the Co-Educational Facility. He is a former Board Member of the Bermuda Land Development Company, and the Hamilton Parish Council. He is the Vice President of Hamilton Parish Temperance Hall, and is also the Constituency Chairman for Hamilton East, where he resides. Pastor Bean has been recognized with numerous awards which include Cablevision’s Rollin Nathan Community Award for work with troubled youth (2009) ; Caron’s Unsung Hero’s award (2009) and an award from G.O.E.S.T., Los Angeles, an anti-gang organization in Los Angeles for outstanding intervention work with gangs in Bermuda. In 2011, Pastor Bean received the Cablevision Community Award on behalf of his organization C.A.R.T.E.L. In his spare time, Pastor Bean enjoys horticulture, reading, and writing. He is the author of a book entitled “The Garden Within: A Place of Covenant Relationship”. Already painfully aware of many of the problems facing her constituency, Suzann is a people-person who is prepared to listen, learn and take action on issues such as job creation and failing education. In St George’s, safety, transportation cancellations, as well as lack of money for maintenance are issues she will move into the halls of government. She will work with the OBA to tackle the government’s massive debt in order to get the island back on track. As the Marketing Manager for one of the largest local food distributors, Suzann has an awareness of constantly evolving worldwide markets and trends. She understands the importance of relationships, deadlines, flexibility and the utmost necessity for communication in building trust and believes that these same tools blend seamlessly into effectively serving the community. A resident of Constituency 4, Suzann is the proud mother of two children and is married to a very supportive husband, who understands her drive and determination. In addition to her involvement with the St. David’s Islanders & Native Committee, Suzann also serves as Eucharist Minister and Vestry Member in the Chapel of Ease, St. David’s. Suzann is proud of her record as a public servant, having had street lights installed along Ballast Point Road as well as laying before the House of Assembly the motion to have St. David’s recognized as a Parish. 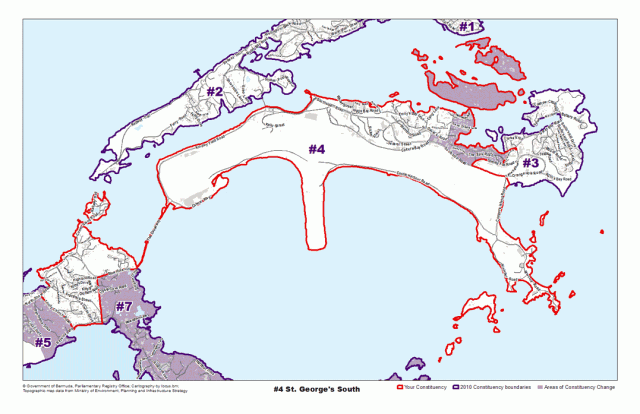 The description for the St. George’s South Constituency is as follows: All that land contained within a line drawn from the junction of North Shore Road with Trinity Church Road; thence North-West to a point on the coastline; thence continuing North-East along the coastline and following the coastline to a point on the coastline South-East of the junction of Long Lane with South Road; thence North-West to the junction of Long Lane with South Road. Thence North along the centreline of South Road to the junction with Paynters Road; thence North along the centreline of Paynters Road to the junction with Harrington Sound Road; thence North-West to a point on the coastline; thence continuing North-East along the coastline and following the coastline to a point on the coastline South-East of the junction of Summit View Drive with Abbot’s Cliff Road. Thence North-West to the junction of Summit View Drive with Abbot’s Cliff Road; thence North-West along the centreline of Abbot’s Cliff Road to the junction with North Shore Road; thence North-East along the centreline of North Shore Road to the junction with Trinity Church Road; and all that land within a line drawn from the junction of St. David’s Road with Lower Gates Road; thence South-West along the centreline of Lower Gates Road to the junction with Southside Road; thence South-East along the centreline of Southside Road to the junction with Cooper’s Island Road. Thence South-East to a point on the coastline; thence continuing South along the coastline and following the coastline to a point on the coastline North of the junction of Tranquility Lane with Chapel of Ease Road; thence South to the junction of Tranquility Lane with Chapel of Ease Road; thence South along the centreline of Chapel of Ease Road to the junction with St. David’s Road. Thence West along the centreline of St. David’s Road to the junction with Lower Gates Road; and shall include Brook’s Island, Burt’s Island, Grazbury’s Island, Nonsuch Island, Idol Island, Brangman’s Fort, Castle Island, Charles’ Fort, Rushy Island, Coney Island and Hall’s Island.